The Skunk Works is the unofficial name for Lockheed Martin's Lockheed Advanced Development Projects Unit – the unit responsible for producing a number of famous aircraft, including the U-2, the SR-71 Blackbird, and the F-117. Among msot recents projects is the F-35 JSF (Joint Strike Fighter). The Skunk Works originated during World War II, when the black projects of the Skunk Works were located near the Burbank Airport, now renamed Bob Hope Airport in Burbank, California. The legendary Kelly Johnson and team developed the P-80 Shooting Star in a circus tent set in the parking lot (as there was no existing secure area) in only 143 days. This aircraft was the U.S. Air Force's first operational jet fighter. Kelly Johnson headed the Skunk Works until 1975, when Ben Rich took over leadership. 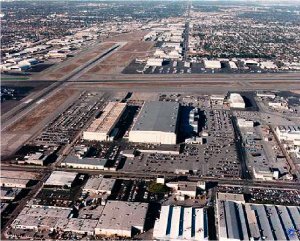 At the end of the Cold War in 1989, Lockheed reorganized its operations and relocated the Skunk Works to Site 10 at U. S. Air Force Plant 42 in Palmdale, California where it is still in operation today. The Skunk Works has used the Groom Dry Lake Air Force Base for testing their secret aircraft prototypes.